We have been blessed with some glorious sunny days recently and hurray, it was the official start of spring on Saturday. It’s always a cause for celebration with the days getting longer, the weather warming up – very welcome after such a harsh winter – and lambs frolicking in the fields. Herald the start of spring with a splash of colour next to your front door. Not only will it cheer you every time you get home but it will please those who pass by or come to visit too. Elegant apricot yellow tulips, early flowering mixed pansies and dramatic trailing variegated ivy make a stylish combination in this unusual – and delightful – late spring hanging basket. Plant in early spring for mid to late spring flowering. Can be completed in about an hour. 20 bulbs of Tulipa batalinii ‘Apricot Jewel’ in pots. Mixed pansies – here there are six different coloured varieties. Four pots of trailing variegated ivy (Hedera helix). Hanging basket with hook and chain. Hanging basket liner (plastic, hessian, felt or moulded paper). 1 Line your hanging basket to prevent the compost falling out, then add a layer of compost at the bottom. 2 Position the four ivy plants first, setting them at equal distances around the edge of the basket, firming them into the compost at the bottom and feeding the foliage through the holes in the side. Add more compost around and on top of the ivy. 3 Next position the tulip bulbs, spacing them as evenly as possible but setting them in at least two distinct layers around the basket, adding more compost and firming in as you go. 4 Finally put in the pansies. Tuck these in as close together as possible, pushing the foliage through the side holes and firming the soil all around the rootballs. Finish by planting pansies across the top and centre of the basket covering all the bare compost – but leaving the centre slightly lower than the sides to make watering easier. 5 Water thoroughly with a fine rose. Then hang the basket in its final position, making sure that the hanging bracket or eye is secure and can take the considerable weight of the basket. To maintain the good appearance of the display and to keep the plants flowering as long as possible, deadhead frequently. This will encourage new flowers to form. Don’t allow the pansies to set seed. Regularly remove any dead or discoloured leaves from the ivy. Leaving at least 2.5-5cm (1-2in) of space above the compost in the basket assists with water retention. Hanging baskets and window boxes contain a lot of plants for the amount of soil in their container, so feed regularly throughout the growing/flowering season with a liquid fertiliser or with fertiliser spikes inserted into the compost at planting time. Water frequently to ensure the plants don’t dry out – especially, if the basket is hanging in a sheltered position where rain can’t reach too easily. 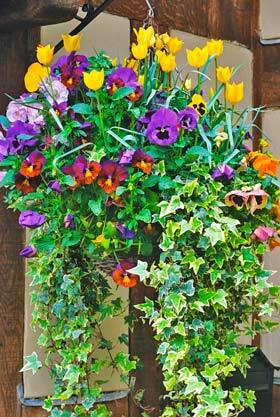 Tulip and Pansy Basket is taken from Seasonal Garden Ideas.